It seems everything they’ve done in class for the last month has been exactly what I need. Somehow remembered this sweep today while reading Hillary’s post on Sherdog about her seminar this last weekend. From butterfly, be sitting up. Keep hooks in. Armdrag one of their arms, so their shoulder ends up pinned against your chest. With outside arm, reach around trapped shoulder and grab under far armpit. Roll back across your shoulder on the side you’ve trapped. Want to start working that when I’m able to drill again. I also got lost 3 times on the way to Philly, so arrived a little late (though they weren’t started yet). And then on the way home, while following Tori out of the city, I had my first ever car accident when some idiot driver stopped on the On ramp, which caused the car behind him to slam on his brakes, which caused Tori to slam on her brakes, which caused me to slam on my brakes, which wasn’t done quite quickly enough — and wasn’t helped by the wet roads — and I rear-ended her. Her little Honda came out better than my SUV and just had a little dent. We pulled over on the teensy-tiny shoulder, noticed that my car was spewing red fluid all over the road, decided that was probably a bad sign, and started the round of calling parents, insurance, tow trucks, and police. The tow truck driver said red fluid was probably transmission fluid. So my car is currently sitting at a dealership somewhere in Philly. Sad. Tori and I have decided, however, that next time we’re going to carpool on purpose. There were about 20 girls there. Anne (“E”) came from Ontario (I think), but actually had a shorter total drive than I did. But Jessica wins — she flew in from Omaha, Nebraska, just for the seminar! (That’s half the country!) 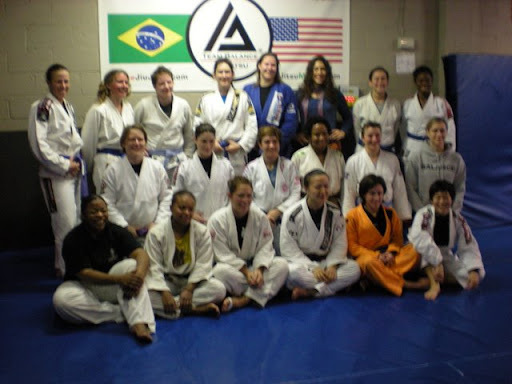 There was also a girl there for her very first day of jiu-jitsu ever. Very good beginning. Emily wrote up a set of notes for us, which is really helpful now that I’m trying to remember (especially since jiu-jitsu was pretty much knocked out of my head for the last while). First we worked on securing side control and north/south, just working through different hand/arm positions. Emily also mentioned not to commit too much to a grip if you don’t really have control with it, else when they move they’ll trap your hand or arm without even meaning to. (Happens to me a lot, so…) Side control: knee/elbow, knee/elbow (both elbows down by their ribs toward the ground and pinching in toward your knees); top hand under head, bottom hand under far arm, palm to palm, shoulder pressure; then top hand under head, shoulder pressure, bottom hand on near hip. North/south, all gripping the belt and pinching the elbows back: over/over; under/under; over/under. We drilled these briefly with our partners, moving between the three control positions for each position. Then a hip movement drill. (I think they did this at the Women’s Grappling Camp in August?) Start in side control. Sit through to front scarf hold. Back to side control. Sit through to backward scarf hold. Leg over to mount. Walk hands around to the side you were just on, and dismount to the other side, through reverse scarf hold to side control. Sit through to front scarf hold. Turn your hips over to come up to north/south. Walk around just a little toward the other side, then sit through to front scarf hold. We drilled that with our partners for a while. I had never seen dismount actually explained and so found that the best part of that drill. 😛 To dismount: first walk your hands to the same side. Then stretch the leg on the other side out and drop that hip to the mat. Open your hips to bring your leg over; now you’re in reverse scarf hold. Come up to side control. Then two submissions. North/south to shoulder lock: First pinch your elbow in on one side, sliding the arm up until your hand meets the fabric along their torso; grab. Now, similar to the end of the previous drill, sit through from north/south to the side you’ve trapped, but this time, to reverse scarf hold (so post out on one leg and swing the other through the hole, with this leg going straight along their body). Your hips should point to the ceiling and you should still have their arm tight. Take your inside leg over and then down between their legs. Arch your hips up (not toward them, which is the tendency) to finish the shoulder lock. Scarf hold to armbar: From side control, sit through to scarf hold. Slide your hand up to their wrist, then sneak your inside knee over their bicep, then sneak your whole leg over. Keep control of their wrist. Pinch their arm between your legs, being sure that their elbow stays above your legs. Good control position here (and they think “What in the world is she doing? She’s got nothing.” Ha!). Secure that trapped arm however you like your armbars, then push off them and spin your feet over their face to assume the armbar position. Feels a little weird, and so needs some practice, but a nice unexpected armbar setup. One more control/position drill, this time when wanting to come up to knee-on-belly or when someone tries to push in to you from under side control. Emily talked about finding the “points” on your partner’s body that you can use to control their entire body. So, to get up to knee-on-belly, put one hand on their near shoulder and one on their far hip. Drop your weight through your hands as you pop up. Then, when you have side control and they’re trying to turn in, instead of trying to wrestle them in place, place one hand on their far shoulder and one on their far hip. As before, drop your weight through your hands. Then king-of-the-hill sparring. Six or seven ladies (the highest belts — one brown, a few purples, and then blues) started out there and could sweep or submit. Those of us going out started in side control and had to mount or submit. We took a short break and then came back for the second half of the seminar. Emily started by talking about how to train: training with the right partners and having a plan/focus when you train to get better faster/more steadily. One suggestion that came up (from Jessica) was to train without arms, since our upper bodies aren’t comparable to the guys’ (and Jessica was actually bigger and stronger than most of the rest of us, and she said the guys still overpower her all the time). Emily also said that you’re only as good as your biggest weakness, so work on your weaknesses. Then back to drilling. Open and spider guard. Started with an individual drill, in Sit-up Guard (never knew it had a name), and then just moving around as she called out commands: “Forward,” “Backward,” “Left,” “Turn right,” etc. Then with a partner — one partner working the Sit-up Guard (with either a quick cross lapel choke or a sliding/clock choke, though from the front), and the other attempting to pass. Next drill was using your feet to re-guard. Partner started standing in side control; reach your outside foot to their farther hip (toward your head); use that to turn back to square. That on both sides. Then partner stood in north/south; cross your legs and swing them over your head; get your feet on the outsides of their legs; then push off their legs to uncross yours and swing back to square. Next drill was switching between positionings for the hook sweep and sickle sweep. (I actually didn’t know either of these coming in.) Start on your back, with your partner standing in front of you. One foot on their hip, the other behind their knee. Keep the foot on the hip; turn to the other side, dropping the foot from behind their knee to behind their opposite heel and grabbing the outside of the other ankle with your hand. Back to foot on hip, foot behind knee. Switch feet. Do the same thing on the other side. Then we actually did the sweeps. Hook Sweep: One foot on their hip, the other behind their knee. Get sleeve control on the same side on which your foot is behind the knee. With the other hand, grab behind the ankle on the other side. Push on their hip, pull on their knee. Follow their momentum over to top half guard. Sickle Sweep: One foot on their hip, the other behind their knee. Get sleeve control on the same side as the foot on the hip. Keep the foot on the hip; turn to the other side, dropping the foot from behind their knee to behind their opposite heel and grabbing the outside of the other ankle with your hand. Push on their hip while sweeping through with the bottom leg. Follow their momentum over to top half guard or side control. Next we played with Spider Guard. Emily talked about never letting your four points of control — both hands and both feet — be in the same plane at the same time, else it’s too easy to break through. It’s like playing with a marionette — keep him moving. First we just played Spider Guard with our partners. Then we worked an outside-in sweep: push one arm/hip point away. Pull the other leg out and wrap it over their arm and under to hook their triceps with your foot. Pull that leg in to collapse them. Move the other leg down, putting your ankle in front of their ankle, at the same time that you drop the other hand either under their leg or to the outside of their leg to grab the fabric. Drive your legs to the far side to sweep them, coming up to knee-on-belly. We finished with a quick re-guard from a single spider guard hook (one sleeve/same leg) (for when the sneaky fast guys think they’ve passed), and then a simple palm-smacking duh! actual pass for when someone has a single spider guard control (one sleeve/same leg)… which I’m not going to mention yet because I think this one, more than anything else at the seminar, is what most girls are taking home to spring on their training partners. I’ll tell you after I get it multiple times in class this week. Then we did a few more rounds of king-of-the-hill sparring followed by 3 three-minute rounds of full sparring. 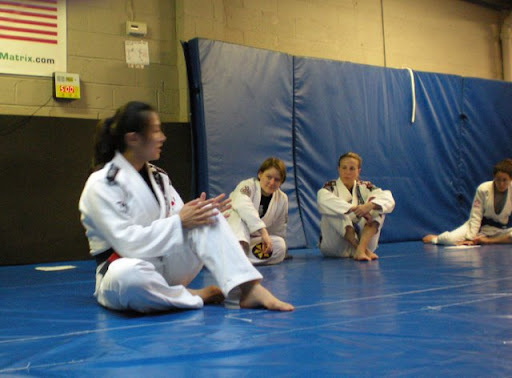 I got to spar with Liz (orange gi), Anne, and Shannon. Dinner afterward, at an Italian restaurant a few blocks away, then followed Tori until I rear-ended her car. But she took me home with her and fed me. Definitely worth going. Also, check out BJJEdge. They were recording parts of the seminar and said they would post some later. Oh, right. I had to wash my belt. It reeked after being trapped in my bag for so long. Sadness.